Be a resource and build relationships: Offer up your expertise, your experiences and your insights to the media. This may not pan out with tons of interview requests initially, but it is setting the stage for the future and building a foundation for a relationship. Working with the media is a two-way street and there needs to be giving on both sides. Relationships take time to build but the investment is well worth it. Relationships begin with a common purpose. In your case, it is finding the writer that covers your topic area. Be sure to identify the right media outlets and the right writers. I know this sounds obvious, but for every targeted pitch that is issued there are at least a dozen (probably more!) wayward pitches that are not a match for the receiving media contact. It is all about matchmaking... and the better your upfront research is, the better the match will be. Have a good story: Storytelling seems very trendy now but the reality is that storytelling is a part our DNA as human beings. There is no denying its power - people have been using stories to make sense of things since the dawn of time. Don’t just cite the facts, tell a story. Tell how you personally suffered and looked for a solution, and found that you were not alone in the quest for this solution. Or perhaps you were inspired by another entrepreneur. Maybe your circumstances came together in such a way that it was clear that there was a gap - and you knew how to fill it. Think about it, you hear these stories all the time – TED Talks, WSJ articles, etc. Now it's your turn. Ultimately, good stories have heroes, villains, drama and lots of characters. Pulling the trigger on news: If you are new to the scene, don’t issue your most important, blockbuster product launch news release as the first announcement for your company. Take some time to establish your company, your role in the industry, your vision and even your viewpoint on the state of a particular issue or product category. It will be important that your company is on the radar first - if you are an unknown, you need to set the stage before you do your big launch. When you decide to reach out to media, be sure you are ready. Have supporting material available: data sheets, product briefs, photos, videos, customer case studies, fact sheets, etc. Be sure you are available to address questions via email and/or phone. As they say, don’t knock on the door and walk away – be there and be present to open the door and welcome the interest. Think outside your product: What issues does your product or service address? What pain point are you solving? What markets are you targeting? Who are your competitors? Now do the research on these areas and you’ll get a view into the ‘media market.’ With this view, you’ll see who is writing about topics that should include your voice as an expert or perhaps should include your product as a viable solution. Before you can chart a course to land media coverage, you’ll have to get a feel for the overall landscape. Media do not operate in a vacuum and if you want to enter their world, you need to understand and appreciate what they are writing about. That means attaching to the topics they are covering. Go with the flow and ride the wave of media coverage. Do some research and check out the topics that are in play in the outlets that you hope to land coverage in. Develop a good story line on how your company fits into this topic, and when you pitch for an interview and/or coverage, cast your offerings within the framework of the issue at hand. You’ll be going a long way to make the writer’s job easier, and you’ll be providing a good reason why your company or product should play a role in the story. 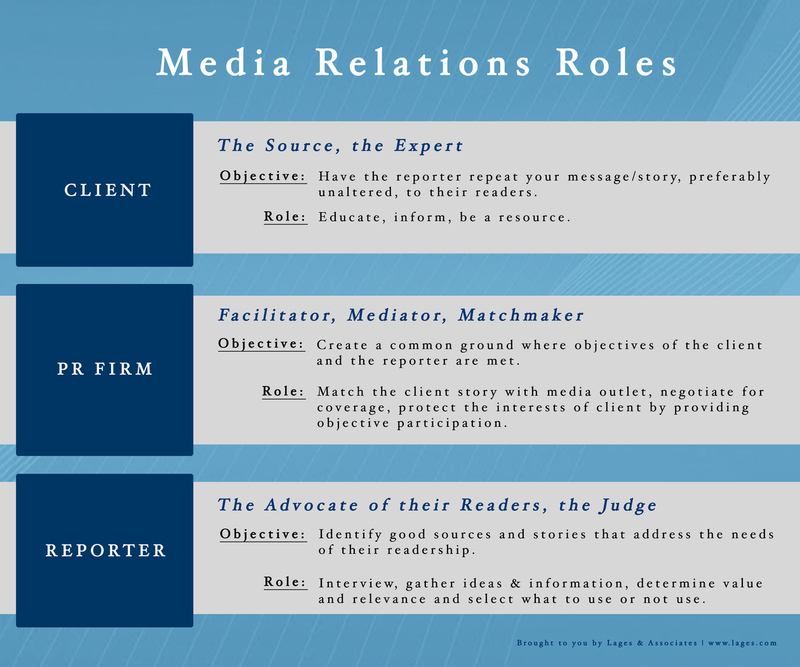 Know the roles and the rules: You’ll be rewarded when it comes to media relations if you simply take a moment to think about the roles of each individual involved in the process of creating a published article. It's called 'earned media' for a reason - and you truly need to earn it. You need to have something of value to say that should be shared with - and of interest to - a particular outlet's audience. You need to be credible so that the reporter is bringing solid news to his or her readers. And – you need to provide all the supporting materials to aid the writer in building a story that truly resonates with his readers. If all of this sounds overhwhelming, that’s ok. That’s where we come in. Lages can help connect the dots for you and do the heavy lifting. We are the facilitator, mediator and matchmaker between your company and the media – we’ll help you balance your messages and package them to meet your goals. Earned media is on its way.